Hi Aspirants, our team has just created the Part-2 of Mock Test for LIC AAO Exam 2016 covering the important Current Affairs events of January - February 2016 likely to be asked in the Exam. 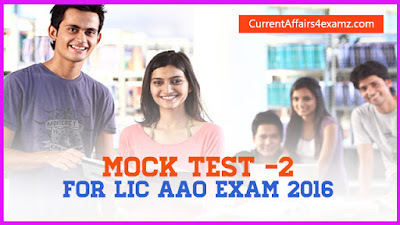 As you the LIC Assistant Administrative officer (AAO) (generalist) Exam 2016 will be held on 5th, 6th, 13th March of 2016. Current Affairs is an important part of this exam and there will be 30 questions from General Knowledge and Current Affairs portion. So in the Part 2 of this mock test also we have included 30 questions. It will help you to analyze and know where you stand in the CA topic. Attempt the quiz and check your score. All the Best.